The 1857 vintage store windows of Gilford’s Grange Museum Building are spot lighting a display of this year’s Thompson-Ames Historical Society’s raffle items. This year’s quilted wall hanging features an 1860 view of “The Potter Hill Farm,” reminiscent of the bygone days when Gilford’s countryside was dotted with expansive family farms. Again this year, local artist Stanley Piper and quilter Ellen Peters teamed up to create a dynamic work of fabric art that could become a treasured heirloom. Stan Piper used fabric pens and markers to produce a luminescent octagonal centerpiece, which Ellen Peters dramatically enhanced with her eye and talent as a quilter. Adair Mulligan’s book “The Gunstock Parish: A History of Gilford, New Hampshire,” published by Thompson-Ames Historical Society in 1995, includes many references to Gilford’s family farms, among them being the Potter Hill Farm that remained in the Potter family until the mid 1940s. At that time, when the farm was being sold out of the Potter family, Fred Potter was instrumental in helping found an historical society for Gilford so that future generations would know what life on a farm had been like. 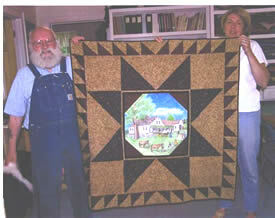 Included in Thompson-Ames Historical Society’s archives is a photo of the Potter Hill Farm, the inspiration for this year’s quilted wall hanging raffle item. The other Thompson-Ames Historical Society raffle item for 2006 is “Hannah”, destined to be a cherished doll reminiscent of the early 1900s. Local artist and seamstress Carol Anderson created Hannah’s beautiful period wardrobe, pictured in the accompanying photograph. Historically, this was a time of family farms but also a time when women were seeing some success in their efforts to be granted the right to vote. In Gilford’s Town Hall there hangs a momentous photograph that shows Gilford women having just come from the polls where they cast their votes for the first time in 1920. 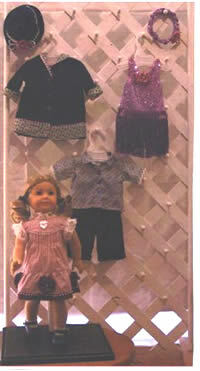 -- This historic event is what a young Gilford girl, such as the doll Hannah represents, could have witnessed. This is why Thompson-Ames Historical Society has had as a raffle prize, since the year 2001, an historic doll, an opportunity to further an understanding of history. Thompson-Ames Historical Society is a 501(c)(3) not-for-profit organization that annually conducts a raffle as part of its fund-raising efforts. The winning raffle tickets are drawn the first Saturday in December. Tickets for Thompson-Ames Historical Society’s raffle items are available in Gilford Village, at the Society’s Grange Museum Building, at 8 Belknap Mountain Road. For further information, please view the Society’s website, www.gilfordhistoricalsociety.org or telephone 527-9009.